Steam the asparagus until just cooked. Cut the spears into halves or thirds depending on length and thickness. 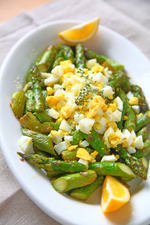 Grate the hard-boiled egg(s) over the asparagus. Chill. Just before serving pour the vinaigrette dressing over the top.